I normally do not write a repeat blog on a race that I have done before, but this 200 was quite different from last year's. It was about 10 degrees hotter. The trails were in better condition in general (lots of trees removed) and better marked, so that made up for some time. But 4 days of high temperatures (mid 90s the first 2 days and slightly cooler the next 2 days) slowed us down more than a better course could make up for. Because I was slower this year, I was able to see during the day the parts of the course that I ran through the night last year. I wish I could say that I was ready for this year's run. Unfortunately, I didn't have the time to train like I did last year where I did a lot of climbing and running downhill with a heavy pack. 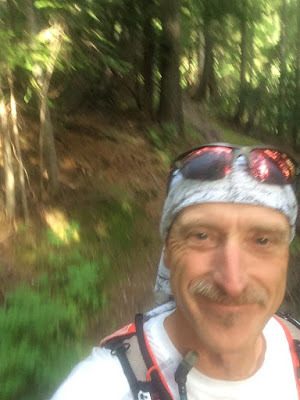 Unlike last year, I did run White River 50 miles two weeks prior. That was a bit of a disaster and worried me that I was going to struggle at Bigfoot. Finally, I worked 9 days straight before Bigfoot. That wore me out more than the race itself. I picked up Mark Tanaka from the Bay Area on Wednesday evening and we headed to the race briefing on Thursday. Pre-race briefing. Photo by Mark Tanaka. 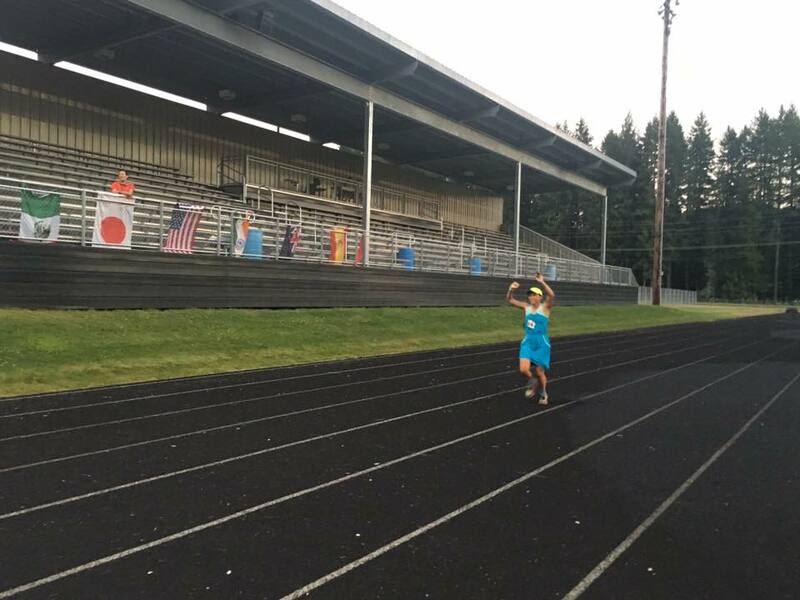 We stayed in Packwood 15 miles away in a hotel and caught the bus from the finish at Randle HS at 5:30 am to the start at Mt. St. Helens Marble Mountain. That was a 2.5 hour drive, bumpy, and no chance to get a few more minutes of sleep. We unloaded at about 8 am, got out SPOT devices, and headed out on the beautiful double track trails in woods at 9 am. My plan was to change packs frequently to alter the weight on the shoulders and prevent chafing problems. I started with an older UD pack that is smaller. I carried 70 ounces of water for this 12.2 mile section, about half exposed and half tree covered. There is a decent amount of climbing but also very runnable sections and footing is good on this part except for the lava field. 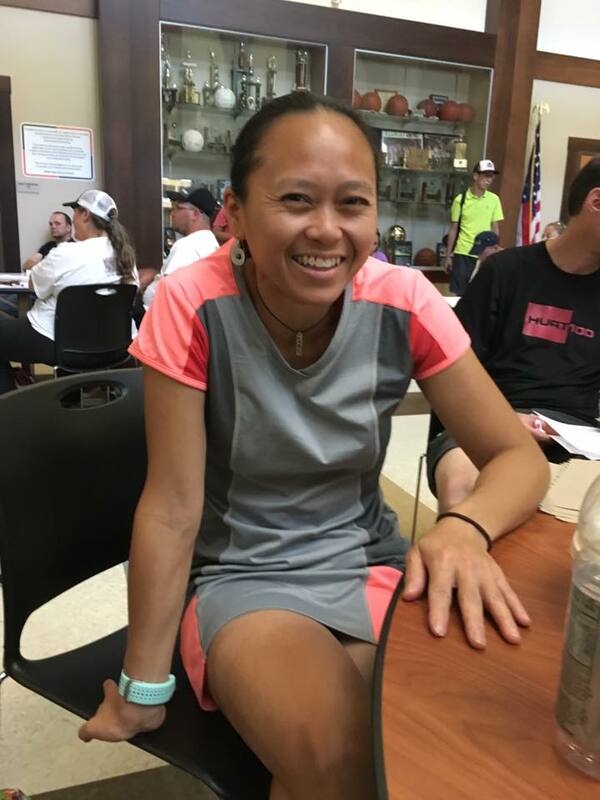 Selina Danko, who also finished this race last year, fell hard in the lava field and scraped and bruised herself only 3 miles into the race. I forced myself to take it easy, drink a lot. I felt pretty good as I entered the aid station. I ran into Matt Hagen on the way in and he was picking berries for Betsy. He had filled my hydration bladder and it was ready to go. Unfortunately, I did not know that some of the food had fallen out of one of the pockets. This would affect me later. It was still very heavy regardless. I again carried 70 ounces of water and brought a water filter. I carried some extra light clothing (shell, hats, gloves, light long johns) and a lightweight headlamp. I knew that I wouldn't need them, but didn't want to take that chance. My new pack was the Peter Bawkin 3.0. I was about mid pack at that time. There were 66 starters and I came in 33rd place. It only took me 8 minutes longer to get there than last year at 3 hrs 7 minutes. I wanted to keep my pace slower than last year because of the heat. The next section is 19.1 miles with a lot of climbing and most of it exposed. 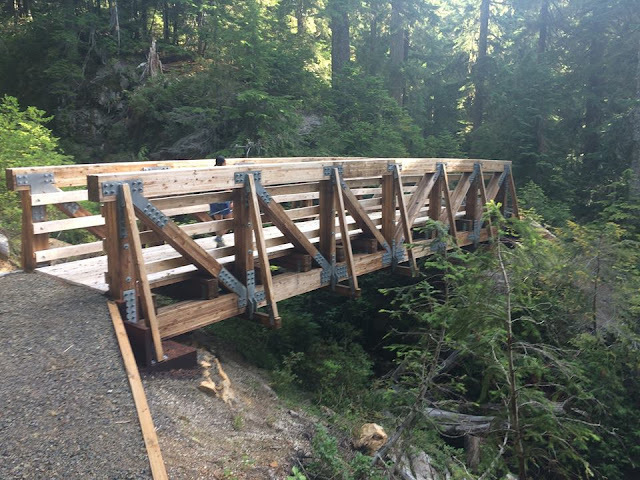 It starts out with a climb in the trees, thank goodness, descends, climbs a little again, and then becomes exposed when it drops down to the Toutle River Crossing. It is exposed before dropping to the river. It was flowing much more than last year. Some were able to do it without getting wet. I did get one foot wet. Poles were a necessity. Last year, I had poles but didn't use them the entire race. I was strong enough without the poles but needed them this year except for the last 13 miles on the road. 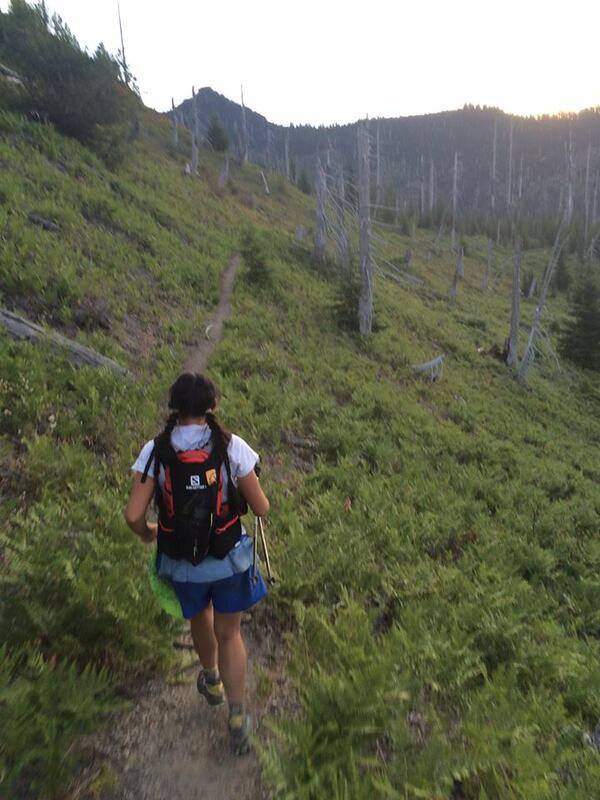 I felt okay coming out of the Toutle River, but then on the exposed climb up, I started getting really tight legs. I ate some pickles that I packed and they helped for a little, but soon I was forced to really slow down my hiking pace. I was passed by several runner, including a two women from Bend, OR. One of them was in her 50s, the other was 60. They motored right on past me in tandem, me in awe of their strong pace. Sue and Pamela from Bend, OR. Photo by Van. I continued to eat, drink, and slow my pace but I still had very achy, tight legs. I could only manage a fast walk with occasional short running on the downs. It was frustrating because this was a nice rolling section along the flanks of gorgeous Mt. St. Helens. I tried not to think about all the people who were passing me. I made the right decision of slowing down as I came upon another runner who was flat on his back cramping. I offered my help, but he just wanted to be left alone. I totally related with that since I have been there many times before. I felt bad for him but kept moving. I noticed that the heat was shutting down my stomach. I was drinking plenty but just felt the water sloshing around. The only thing that helped it was to back off. Footing became a big deal for me this race. Last year, I was strong enough to handle the technical footing. It was still good in this section except for when we went through the blast zone. There were also some stream crossings that were muddy, not really a good water source. We were able to get through these without getting our feet wet. I knew there was a small waterfall with great clean and cold water coming in a shaded area. Most spent a decent amount of time here cooling down and drinking. I filtered my water and continued on fairly quickly. Some more rolling and descending until a short steep climb. I was really struggling here because I was almost out of food when some of it had fallen out into my drop bag. It was at this time that I met Mark Jolin and Filip Boelen. I noticed Filip had a pretty big pack and asked if he had some extra food. He gave me 2 V-Fuel gels and that saved me until I got to Windy Pass aid station. After the climb, there was a steep descent, more rolling, and a little bit of climb before dropping to the Windy Pass aid station at 50K. I was feeling better at this point, with the sun going down and temps improving. Almost to the aid station thank gawd! Photo by Van. Several runners were still there when I arrived, including Filip and Mark. That was the last I saw of Filip. The Bend girls had left. I had to go #2 (the first of many times-7) but the ground was too hard to dig a hole, so I stepped away from the aid station and used my scented doggie bags. That worked out well! I arrived here in 9 hrs 49 minutes, compared to last year's 8:35. It took me an extra hour to get through this exposed section. I was feeling better and left strong. I did grab a couple gels but had packed a small zip lock of Oreo cookies and other goodies, only to leave them on the aid station table. Damn. I was going to run out again before the next aid station. Fortunately, I was able to hock another gel from a guy that I caught and passed. I had also just passed the Bend gals. They wanted me to tell their crew that they were on their way. This section went through some marsh areas, bushwacking, but overall runnable. I was walking the small hills, running the rest. The sun was going down but I knew that I would be able to get to the aid station before needing to get out my headlamp. I arrived at Johnston Ridge aid at 39 miles in 11 hrs 49 minutes compared to 10:43 last year. I was pretty wasted when I came in, not focused and forgot to put my SPOT on my new pack. I didn't realize it until I was about 2 miles out, so not practical to go back for it. 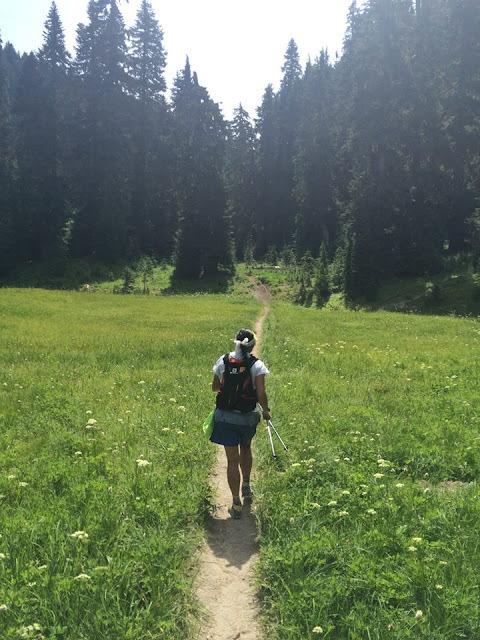 I had switched to a lighter Scott Jurek pack for the short leg of 6.6 miles, mostly downhill. I did eat half a hamburger before I left. I moved along okay, not slow, but not fast. My asthma was affecting me a little and I had to use my inhaler. This section is mostly downhill with short ups, again all runnable. I did run some of them, walked a few. The down helped with my asthma, allowing me to clear my lungs, less taxing on them. I hit the road into Coldwater. The markers were hard to see here even with the reflectors. It would have been great to have some flour arrows or something on the ground. I ran in strong to Coldwater where David Molenaar was waiting for me. He had been waiting a while. I arrived at 13 hours 30 minutes (or 10:30 pm). Last year, I got here at 12 hours 27 minutes. I was ready to get moving but decided I had better get my SPOT back. Fortunately, Matt and Betsy were there and Matt drove the 7 miles to Johnston to get my tracker. Thank you Matt! Betsy had missed the cut off at Blue Lake. She had struggled with the heat. I waited at the aid station for 30 minutes before I could leave, anxious now to make up some time, which was not a good strategy. So in summary, the first first 45 miles has good footing for the most part except through the blast zone and lava field, very exposed especially after 15 miles with only one good water source in the 19 mile stretch from Blue Lake to Windy Pass. I switched packs here again into my Salomon 12L. Now I was using water bottles instead of hydration bladder. We struck out into the night. The 4.5 mile section along the lake is pretty runnable but overgrown, so this will slow you down. I remembered it was overgrown, but seemed more this year. It could simply have been that I was more tired and struggled more. Dave was behind enjoying the moonlight on the lake and taking pictures. Coldwater Lake. Photo by Dave Molenaar. It was a nice night. I was still holding some of the heat in my body. After the rolling 4.5 miles, it climbs in earnest for 8 miles to Mt. Margaret. The trail opened up a little but then became overgrown again. There were some very steep sections, some running down, some sketchy trail along a rock face. It seemed to take forever to get to the out at back at Mt. Margaret. I knew that we were missing some of the best views of this race. 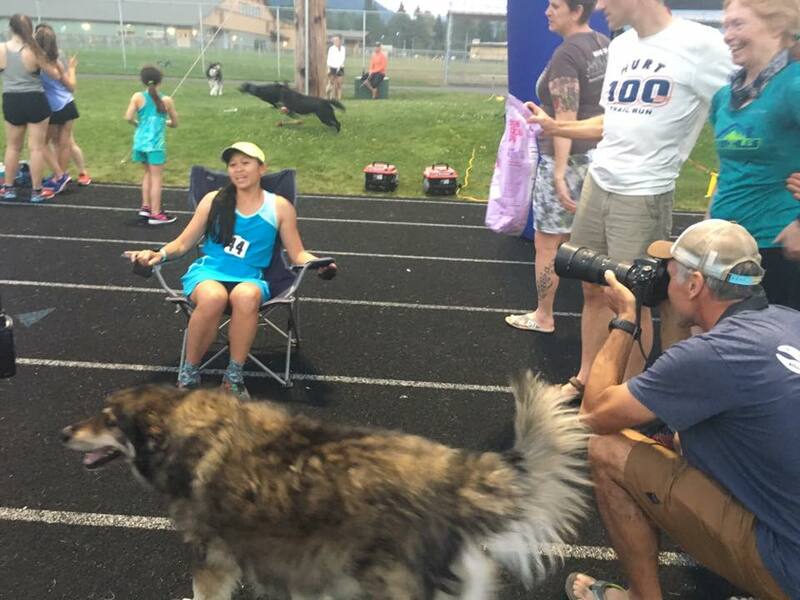 I had seen it during my pacing duties at the 120 miler. The out and back is short but I was feeling the effort. Mt. Margaret turn around. Photo by Dave Molenaar. I had it in my mind that it was all downhill from here until the aid station and it was only 4 miles away. I was wrong. There were still several steep ups before it descended, and it was more like 6 miles down. I tend to have the bad habit of stopping eating and drinking if I think I am approaching an aid station as well as picking up my pace. I made this mistake again. I was bonking in the last 2 miles to the aid station to Norway Pass, now over 100K. It was getting light and I arrived at 5:41 am, 20 hours and 41 minutes. I continued to lose time compared to last year. It was 18 hrs 57 minutes. I came to the realization that I would not be able to make it up. The heat had taken it's toll and continued to slow my pace. Descending to Norway Pass. Photo by Dave Molenaar. Beautiful single track. Photo by Dave Molenaar. I was pretty good at eating real food at the aid stations. I figured this would help me feel stronger again. But what I noticed was that I was getting weaker. The next section had a lot of downed trees, although less than last year. It was hard to get a rhythm. I found that getting over these trees would leave me breathless, winded. I kept eating more and more thinking that I just needed calories, but I still had the problem. Finally, turning a switchback, I had some shortness of breath and realized that it was my asthma that was acting up and making me feel like I was bonking. I used my inhaler once again and immediately felt better. I was able to pick up the pace. In addition to the asthma, my feet were starting to have hot spots. The steep up and downs placed a lot of stress on areas that are not used to it. Good morning Mt. St. Helens. Photo by Dave Molenaar. I arrived at Elk Pass at mile 75.5 at 25 hours 14 minutes compared to 22:42 last year. I decided to change socks here and that helped. My feet felt great for a few miles. I again ate real food. My slow pace and lots of food led to pretty frequent #2s. Normally, I only go once during a 100 miler. The next section was a lot, I mean a lot of climbing with some of it in the sun and heat of the day to rock outcroppings. Basically, we did countless steep climbing and running down on technical, rutted bike trails. This really made my feet feel worse and my blisters were starting to rub more. I was able to run a lot of these downhills last year but was slowed to a walk or jog this year. We finally arrived at the 5 mile downhill to Road 9327. Only thing was that it was up and down with a net loss. And, it was more like 5.5 miles to the aid. I ran out of water (no water on this section), and was again bonking hard. I arrived at the aid station tired, parched, and demoralized. This made me anxious and I had a little asthma attack. I used my inhaler again. I immediately took in a lot of water and coke, ate some food, and felt much better when I left. Howie Stern said I looked so bad entering the aid station that he could not get himself to take my picture. However, when I left, I was smiling and thumbs up. Road 9327 was 90.5 miles. I arrived at 31 hours compared to 27:44 last year. My overall place continued to improve now to 18th overall. I was 4th female. I was way behind female 1 and 2, close to female 3. One of many solid bridges. Photo by Dave Molenaar. I expected the next section to be very hard. It stuck with me from last year, so I thought I was mentally prepared for it. I continued to stumble on the rutted downhill sections because of fatigue and blisters in my feet. The air was still quite stagnant even with evening temps. After what I thought was the top and expected to run down, we had about another mile of up. Then the down was quite long. Once again, I was wasted when we got to the aid station at Spencer Butte at about halfway of 101.7 mile and 36 hours 32 minutes, compared to 32:13 last year now 4 hours difference. I had a burger here. All the aid stations had been stellar. I always got what I needed. I again changed socks here. I tried to keep my spirits up. You can do this Van! Photo by Dave Molenaar. We decided to walk the next 2 miles on the road. My strategy had changed earlier in the day to take it as easy on my body as I could in the first half of the race when it was hotter and see what I could do in the second half. There was no rush to get to Lewis River, mentally my halfway point. We turned right onto the descent. We were told it was very overgrown and hard to see the trail. I thought the trail was easy to see, but the markers were few. What really made this section hard was the spiderwebs and I spent the next 2 miles using my poles to bring down the webs. This was taxing and left me covered in spider webs, feeling sticky and gross. The air was really stagnant here as well before we were able to get closer to the river. We finally got on the trail along the river which were nice groomed trails but I kept catching my toe on a low root or rock. This frustrated me tremendously. I was tired, sleepy, and just wanted to rest. It took much longer to get to Lewis River than we expected. There was a lot of running on twisted trails in the park and I was not sure how much further we had to go. Selina came running past us both. I didn't realized I had passed her earlier. She apparently stopped to sleep at Road 9327. She didn't stop to say hi, so I figured she was trying to snag one of the sleep station beds before I got there. 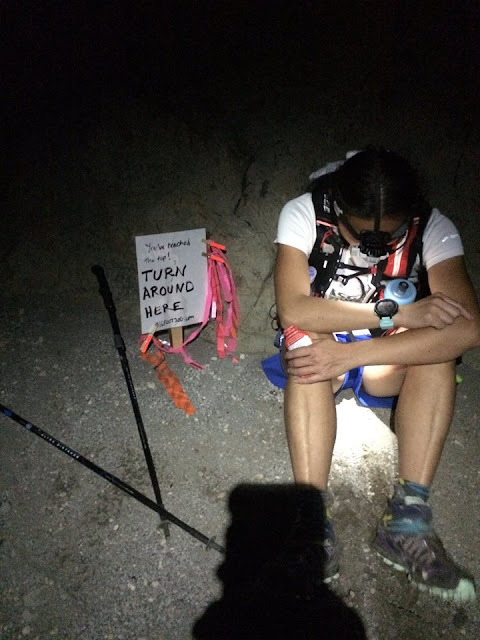 She was just sitting in a chair at the aid station, getting her feet worked on. She left soon after I arrived at 111.3 miles, 41 hours 33 minutes, compared to 35:40 last year. My plan was to eat, change, and sleep. I wanted my total time there to be about 2.5 hours. I used wipes to give myself a good sponge bath, changed into all new clothes, worked on my foot blisters, and put on new shoes. I used my albuterol. I ate part of a hamburger and some watermelon. I said good bye to Dave and thanked him for getting me to Lewis River. He was taken back to his truck at Coldwater by Allen Skytta, 3 hours away. Pacer extraordinaire. Photo by Dave Molenaar. Tonya had been resting waiting for me. I tried initially to sleep in the tent but then decided to just lay down on a cot outside by the aid station. I wanted to leave by 4:10 am, but it was more like 4:30 am. I ended up getting 30 minutes of sleep. I left there still tired but was able to get moving. Immediately we had a hard time finding the trail. It was marked incorrectly and we bushwacked through some branches. We realized the trail went up to the left. We placed the marker on the correct side, but I wondered why the earlier runners did not fix this. I lost about 10 minutes just trying to figure out where were supposed to go. We were running through the Quartz Creek trails, a series of steep ups and downs and across creek beds. My legs felt great after the stop at Lewis Creek and I was able to power hike strong, run downhill strong again. I had a good first half of this section, slowing again from fatigue and the return of the heat. I had to lay on the trail side for about 7 minutes to wake up again. Tonya found that I was running more than walking and had to shed some clothing. Overall, I made good time on this trail more than others. My goal was to do most of this trail during the early hours of the morning in the cooler air and that certainly helped. After what seemed like forever, we arrived at a road that lead us shortly to the aid station less than a mile away. Council Bluff was 130 miles into the race. I arrived at 11:20 am Sunday morning, 50 hrs and 20 minutes compared to 45:37 last year. I didn't stay here long. I had momentum on my side. I had heard that Selina was still in the sleep tent. Someone told me that the passed out when she tried to leave there and was recommended to stay and rest. The next section started out with some climbing about 3 miles then some nice downhill running on service roads, another short steep climb, then 2.7 miles mainly flat on road again before getting back onto single track trail for about 2 miles to Chain Lakes aid station at 140 miles, 55 hours 4 minutes, 48:49 last year. I refueled here with potato soup. It was delicious! I stopped eating real big meals because I was pooping so much. I knew the next section was pretty and runnable. Sure there are some hills, but this is not what defines this section. I just miscalculated how long it would take. Also, there were 5 water crossings. I got my feet wet on the second one. They dried out by the 5th crossing at Cispus. It took forever and a day to get to Cispus. By this time, we had caught up with Mark Jolin and Nick Davis. We crossed together, getting about knee high. My feet do not do well with crossing cold rivers. They are very painful as they start to warm up. It takes about 10 minutes for them to feel better. I decided not to change socks even if I had some dry ones in my pack since it was getting dark and I wanted to get to Klickitat as soon as possible. But as we started the climb to Elk Peak, it became clear to me that I was not able to stay awake. I asked Tonya to lead so that I could just follow her shoes. I could not distinguish the trail from it's surroundings. It helped tremendously to follow her. We again caught Mark and Nick, who were both falling asleep. They joined the train and the 4 of us with Tonya in the lead were able to motor through this beastly climb. We finally got to the out and back. Howie was up there, We didn't notice him until we headed down. Tonya and I took off down to the aid station before Mark and Nick. It again took longer than expected. It was about 2 miles, very steep in some sections. Fortunately, I was able to move well down this. There were a ton of runners at Klickitat when I arrived at 63 hrs 22 minutes, compared to 56:30 last year here at 157.4 miles. I wanted to leave here about 2 am. It was 12:22 am. I didn't change clothes other than put on some compression calf sleeves so that my legs didn't get scratched to death from the overgrown trail. I worked on my blisters and put new socks and shoes on. I had some amazing home made chicken noodle soup, tomato basil soup, and bread. After about another 30 minutes of closed eyes or sleep, I left with Tracy for the final 50 miles. I thanked Tonya for her company and great pacing job. She went to get some well deserved rest. Immediately, upon leaving, I had trouble focusing on the trail again. It looked like the forest floor was one big carpet. I could not make out the trail. So I had Tracy lead. I was somewhat able to keep up. I again had trouble on the technical and steep down. The change in shoes and socks did not help a lot with the blister pain. I had to land gingerly. After a while, I needed to sleep on the trail for 10 minutes. I tried to do this closer to dawn so that it would help me long enough before the sun came up and would wake me up. The rest helped and I was able to stay awake for the rest of the race. I did most of this trail during the dark, but as it became light I was able to enjoy what I missed last year. It was gorgeous. Plus, it was easier to see the trail. Last year, it was marked sparsely and we lost the trail frequently. I was passed by Rick Arikado, who picked up a pacer finally at Klickitat and was moving really well. We found Mark Jolin just waking up from a nap. Apparently, he tried to get up and keep up with us but was still too sleepy. He was planning on doing the race without sleep. He decided to find a place to rest and went off trail for a while. About 6 miles. He was quite delirious when he got to an aid station. Again, this trail goes on forever, has a lot of PUDs or pointless up and downs (trademark Trail Nuts). There were overgrown sections. 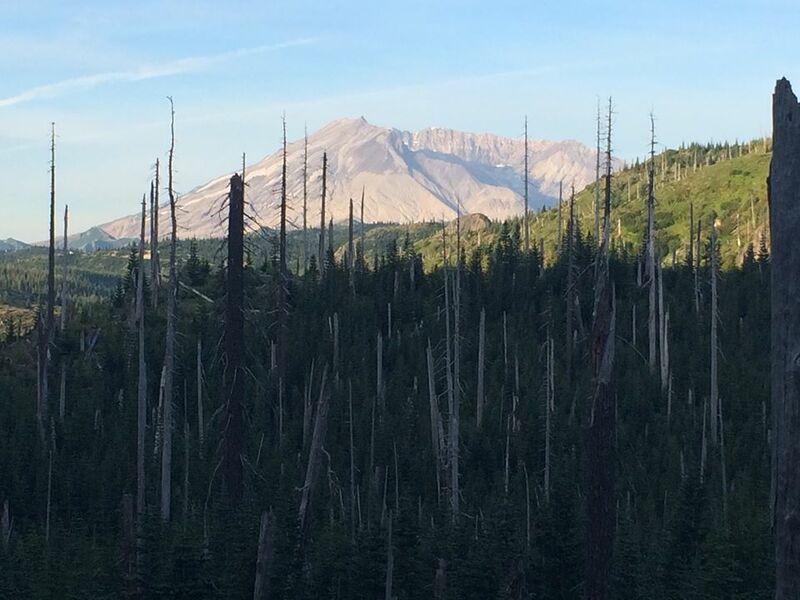 Finally, after you do a steep climb, you get up on some meadows, fun trails, and then the out and back to Twin Sisters with net downhill and good footing. At the beginning of the out and back, I saw the lead girl Katie Graf. She looked good, smiling. I also saw Rick and his pacer about 1/2 mile from the turn around. 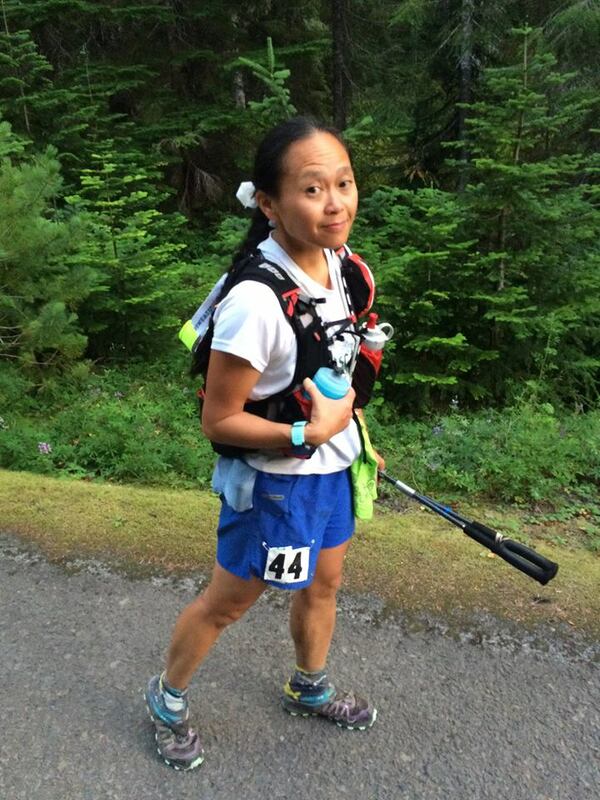 I arrived at the Twin Sisters aid station at 11:09 am, 74 hrs 9 minutes compared to 69:36 last year. Geri emerged from a sleep tent and left. She took off, trying to gap me. I wanted to just enjoy the rest of the race with Tracy, so I backed off when I saw how far she was ahead of me on the Pompey peak out and back. At Twin Sisters, I ate some more potato soup and watermelon. I had a strong climb out. I ran into Nick Davis and Jeff Wright. Also saw Daro Ferrera. A lot of these trails are runnable, if you still have legs. This is where the downed logs begin, less than last year thanks to trail work by Candice and her crew. The climb up Pompey Peak was more than the 0.2 that was on the trail sign. And steep. We made what I felt was good time down to the bottom of the trail, then it climbs again to the Green Tunnel, which was much more overgrown this year. Less of it was runnable. Also, when you reach this, it is 6 miles to the aid station. I wanted to believe it was 5 miles. 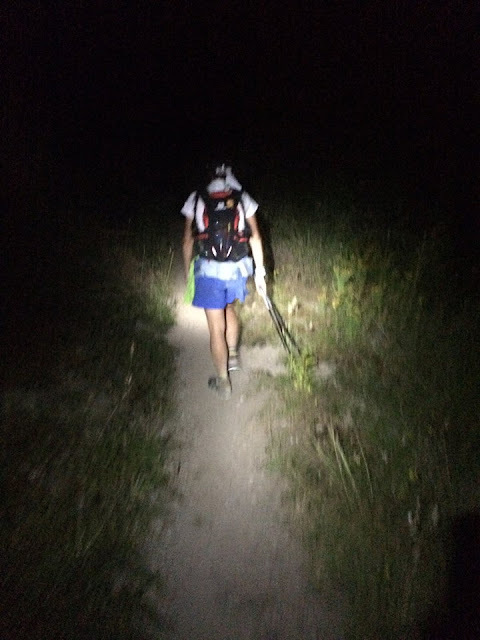 I arrived at the last aid station at Owen's Creek at 190.8 miles at 79 hrs 58 minutes, compared to 76 hours last year. I had gained some time back. It was now 5 pm. I wanted to finish before darkness. But first, I had to change into my running dress, drop my pack, and wear a waist pack. I didn't change shoes or socks. I didn't want to disturb any of my taping. The gravel part was hard for me. Just the small rocks bothered my feel and I did a run/walk. Once I got to the road with smoother surface, I was able to pick up my feet without fear of tripping on rocks and rolling my ankle. I ran strong until the end. I did stop to walk several times if there was a hill, but for the most part, we ran. I passed one runner who was walking. Finally, we made a turn on the road and saw the bridge! This meant we would be passing Mt Adams Cafe and only about 1 mile left. We crossed Hwy 123, ran/walk along the back road, and once we reached Kehoe Road, I ran to the finish. We entered the parking of the High School and as soon as I entered the track, I dropped my waist pack and ran as hard as my legs would let me. I dropped Tracy and finished strong to the cheers of everyone who was at the finish line. It was wonderful! My finish time was 83:25, compared to 79 hours last year. I was really pleased that it was not much more considering the heat. 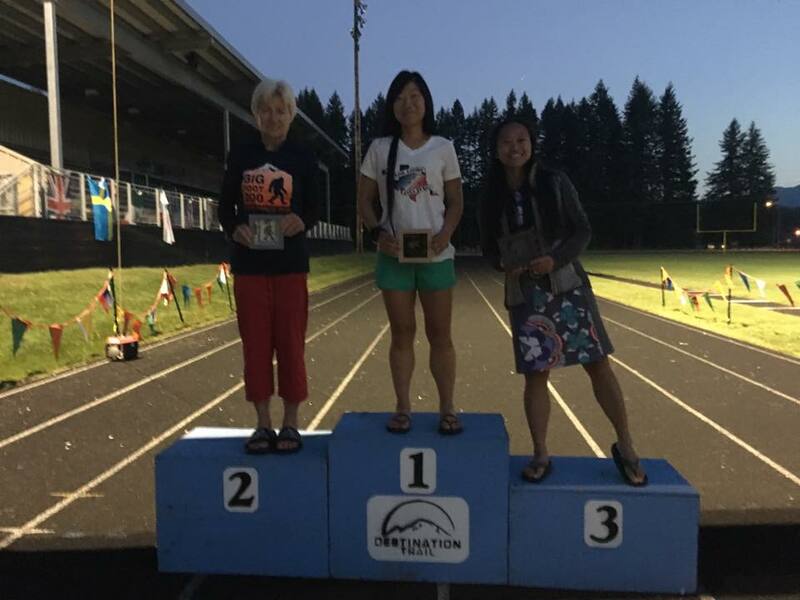 My split from Lewis River to the end was 2 hrs 44 minutes faster than the first female and 4 hrs 2 minutes faster than second female. Only a few more meters! Photo by Mark Tanaka. I hugged Candice immediately, gave Howie a high five, and sat in a chair. I was so happy to finish and not quit. Matt Hagen and Richard Kresser (overall winner with new CR with a 62:18) encouraged me to pick out my buckle. There was apparently a favorite and they wanted to see if I could pick it out. I really liked the buckles with a large white flower and liked the one with the black background the most. As I contemplated it, they were standing behind me eyeing each other. Turns out I picked the right one! I was offered food but all I wanted to do was to have a shower, even if it was in their outdoor camp shower. It was cold but did the trick of getting off the thick 4 days of slime. I finally ate a custom pizza, so good. I stayed awake for several hours seeing others come in before trying to sleep on a cot. I was too hot, so I got up, ate some more, and watched as more runners came in. I did go back and got 3 hours sleep. Then didn't sleep for the next day. Too much happening with runners coming in. As of the morning, there were still 20 runners out there. Soon it became very hot again. I really felt for them. I cleaned out my drop bags that were back, ate some more. Didn't even leave the high school. Every finish was a highlight, but for me it was when Reed Glesne, who dropped last year at Twin Sisters at 174 miles and came back to finish with even harsher conditions. He is 64, turning 65 in one week! He looked so happy and his wife Susan paced him to the end. After a catered dinner of hamburgers, mac and cheese, and peach cobbler, we enjoyed the awards ceremony. I received my 3rd place female award, my second podium finish in 2 Bigfoots. Katie and Geri were amazing in their consistency. It was fun to have a little competition out there to help push us. I was able to act somewhat of a mentor to Katie prior to the race, answering a few questions to help her decide what packs to use and what to have in them. Looks like my advice helped! We left soon after that was done and started out 2 hour drive home. I had to stop a few times to sleep, having a hard time staying awake on the windy and dark roads. Mark drove a stretch. Somehow made it home without crashing my car. Finally got some sleep Tuesday night. So from Friday morning when we had to wake up at 4:30 am to catch the bus to Wednesday morning, I had just over 10 hours sleep. I know the race staff did not get much more. Will I do this again? I said no many times during the race but probably will. Now Cascade Crest in less than 2 weeks. Last year, there was a gap of 3 weeks. This will be tough, but I will be going for my 9th finish at Cascade. Just going to take it easy! Love the originality of the buckle and awards! Materials from the course. Photo by Van. I can't thank everyone enough for their time and love in taking care of the runners from the RD to every last volunteer. We all know we can't do this kind of stuff without your help!